Offering the perfect balance of gas assisted fingertip adjustment and contemporary styling, with a sleek streamlined design. Offering a lockable quick release VESA function as well as being 75mm &100mm VESA compliant. 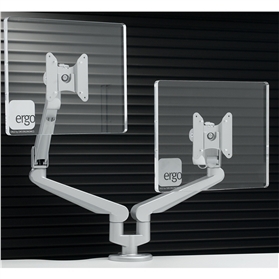 A double monitor arm mount suitable for both c clamp and through desk applications; this mount allows for both side by side or back to back positioning of the screens. Dual screen working is proven to increase productivity within the workplace. Holds monitors up to 8kg.